Korea Exchange Bank(KEB)/Hana Bank, a major private Korean financial institution, has become the subject of debate this November due to its“university student supporters program. It has turned out that university student supporters were required to engage in sales promotions with no pay or compensation. What they got instead was 30,000 points every month that can be used for banking services. “Supporter” literally means a person who supports someone or something, such as a political leader or a sports team. 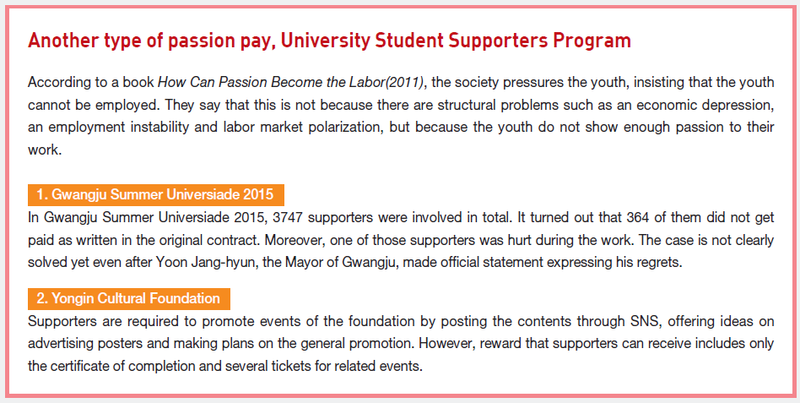 For Korean university students, however,“Supporters program" refers to an extracurricular activity where students help promote a company as a supporter. Both private and public enterprises recruit university students as supporters, saying that they are giving them opportunities to gain work experience for about six months to one year. However, university student supporters programs are moving away from this original purpose. The National Statistical Office reported that those who are currently looking for a job number over 637,000 on November 11. However, Korea’s top 30 firms have planned to reduce the number of new employees by 30 percent from last year, according to the Federation of Korean Industries. As a result, desperate university students hoping to increase their slim chance of gaining employment take part in supporters programs.“I have done three different kinds of supporters programs to become more knowledgeable about the field that I want to enter in the future, but it was far different from what I expected. I was so exhausted that I delayed my graduation last semester,” said a Senior at Sogang University who requested anonymity. In 1998, Dong-A Pharmaceutical Corporation sponsored the nation’s first walk through the entire country, which was the first program of its kind in which university students were recruited. The idea was for the students to participate in this promotional event in exchange for gaining a new experience. After the entire journey was aired on Munhwa Broadcasting Corporation(MBC) in 1998, the event received positive responses from the public. The challenges that the university students overcame energetically, particularly during this troubling period of the Asian financial crisis, were inspiring to many viewers. These days, however, university students are taking on supportive roles as “publisumers, which is a recently coined phrase from the words“publicize” and “consumer.” It describes consumers who publicize or selfpromote themselves. As the influence of product reviews on Social Network Services(SNS) continues to grow, the role of publisumers has become an essential marketing strategy for many Korean businesses and institutions.“Diverse promotion methods have appeared as market is getting bigger and customers are divided into various types with different characteristics. Publisumers including marketers or supporters can approach closer to unspecified number of people through both online and offline,” explained Lee Gwang-soung, a Marketing Consultant at Digital Contents Marketing. For example, cosmetic companies are actively using this marketing method. The cosmetic brands of Amorepacific Corporation are well known for this strategy. Espoir, for instance, recruits 20 people as supporters twice a year, and they advertise Espoir products online. Kim Da-yeong, a famous beauty Youtuber and blogger who has more than 290,000 subscribers, was one of their supporters in 2014. The recent proliferation of university student supporters programs is linked with this phenomenon. Korea’s major conglomerates such as Samsung and CJ, as well as nonprofit organizations like Habitat for Humanity Korea, employ university student supporters programs in line with this strategy. Even universities run supporters programs including Hanyang University(HYU) which recruits students to participate in publicity projects and events such as small music concerts and movie nights to boost the university’s brand image. Supporters programs are usually divided into two separate groups. One is concerned with the overall promotion of the sponsoring organization through both online and offline events. “University student ambassadors” or “student reporters” are well known types of this supporter with different titles. The other involves marketing strategy where “student marketers” devise new promotional ideas for products or services. First and foremost, university student supporters programs allow hosting organizations to promote themselves on a lower budget. This is because hiring university students costs far less than using professional advertisements. “Regularly publicizing his or her activities both offline and online is required task for each university student supporters. This is why university student supporters programs have great ripple effect, at least raising brand awareness,”explained the Marketing Consultant Lee. At a lower cost, these corporations can also obtain new ideas from the participants. Supporters of the LotteFoods University Student Marketer Hidden Supporters program carry out individual and team missions where they must compete with creative advertisement ideas. Then, the winning team must produce the advertisement under a limited budget. Moreover, organizations that run supporters programs can boost their public image as a socially responsible firm. This is because running supporters program is different from hiring irregular workers in that what supporters want is the opportunity for work experience, not money. A survey by ThinkGood, an employment portal site, reveals that over approximately 95 percent of the respondents have positive views on companies with supporters programs. On the other hand, university students are interested in the benefits offered by organizations to gain experience for future employment. This is because some companies give extra points for former supporters when they apply for jobs or internships. Also, the notification that those who are nominated as the best supporters are going to be exempted from candidate selection through papers makes participants try hard. There are even opportunities to build connections and networks with others in the same field. According toa survey by The Hanyang Journal(The HJ), 45.12 percent of those who had taken part in university student supporters programs answered that building connections was the biggest merit. “Information on various employment opportunities from people I met through supporters programs was quite useful when preparing for other extracurricular activities,” said a respondent of the survey. Although the benefits may seem mutual for hosting organizations and university students, the programs have come under criticism as student supporters do not receive adequate benefits compared with their contributions. For instance, Kookmin Bank’s University Basketball League picks 15 student marketers from each university to promote its annual games. 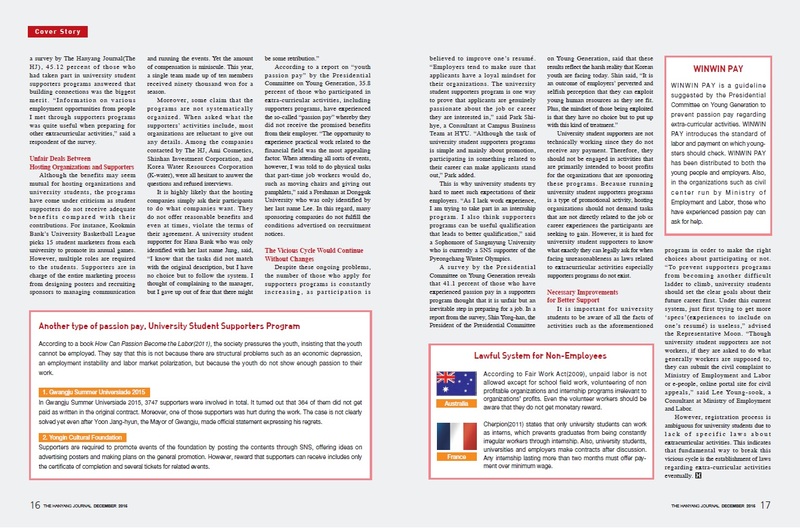 However, multiple roles are required to the students. Supporters are in charge of the entire marketing process from designing posters and recruiting sponsors to managing communication and running the events. Yet the amount of compensation is miniscule. This year, a single team made up of ten members received ninety thousand won for a season. Moreover, some claim that the programs are not systematically organized. When asked what the supporters’ activities include, most organizations are reluctant to give out any details. Among the companies contacted by The HJ, Ami Cosmetics, Shinhan Investment Corporation, and Korea Water Resources Corporation (K-water), were all hesitant to answer the questions and refused interviews. 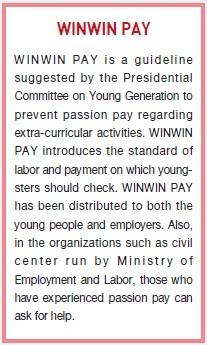 According to a report on “youth passion pay” by the Presidential Committee on Young Generation, 35.8 percent of those who participated in extra-curricular activities, including supporters programs, have experienced the so-called “passion pay” whereby they did not receive the promised benefits from their employer. “The opportunity to experience practical work related to the financial field was the most appealing factor. When attending all sorts of events, however, I was told to do physical tasks that part-time job workers would do, such as moving chairs and giving out pamphlets,” said a Freshman at Dongguk University who was only identified by her last name Lee. In this regard, many sponsoring companies do not fulfill the conditions advertised on recruitment notices. Despite these ongoing problems, the number of those who apply for supporters programs is constantly increasing, as participation is believed to improve one’s resumé.“Employers tend to make sure that applicants have a loyal mindset for their organizations. The university student supporters program is one way to prove that applicants are genuinely passionate about the job or career they are interested in,” said Park Shihye, a Consultant at Campus Business Team at HYU.“Although the task of university student supporters programs is simple and mainly about promotion, participating in something related to their career can make applicants stand out,” Park added. This is why university students try hard to meet such expectations of their employers. “As I lack work experience, I am trying to take part in an internship program. I also think supporters programs can be useful qualification that leads to better qualification,” said a Sophomore of Sangmyung University who is currently a SNS supporter of the Pyeongchang Winter Olympics. University student supporters are not technically working since they do not receive any payment. Therefore, they should not be engaged in activities that are primarily intended to boost profits for the organizations that are sponsoring these programs. Because running university student supporters programs is a type of promotional activity, hosting organizations should not demand tasks that are not directly related to the job or career experiences the participants are seeking to gain. However, it is hard for university student supporters to know what exactly they can legally ask for when facing unreasonableness as laws related to extracurricular activities especially supporters programs do not exist. It is important for university students to be aware of all the facts of activities such as the aforementioned program in order to make the right choices about participating or not.“To prevent supporters programs from becoming another difficult ladder to climb, university students should set the clear goals about their future career first. Under this current system, just first trying to get more‘specs’(experiences to include on one’s resumé) is useless,” advised the Representative Moon. 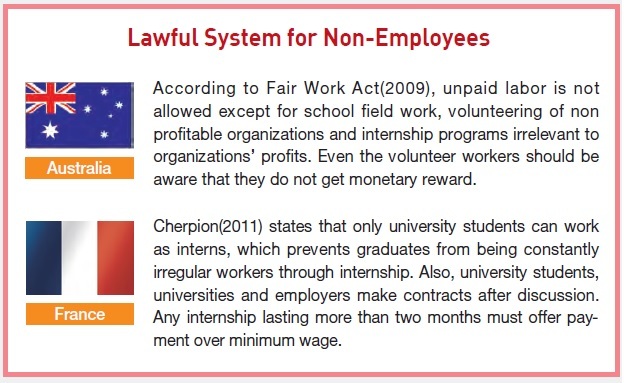 “Though university student supporters are not workers, if they are asked to do what generally workers are supposed to, they can submit the civil complaint to Ministry of Employment and Labor or e-people, online portal site for civil appeals,” said Lee Young-sook, a Consultant at Ministry of Employment and Labor. However, registration process is ambiguous for university students due to lack of specific laws about extracurricular activities. This indicates that fundamental way to break this vicious cycle is the establishment of laws regarding extra-curricular activities eventually.